Babies are adorable. 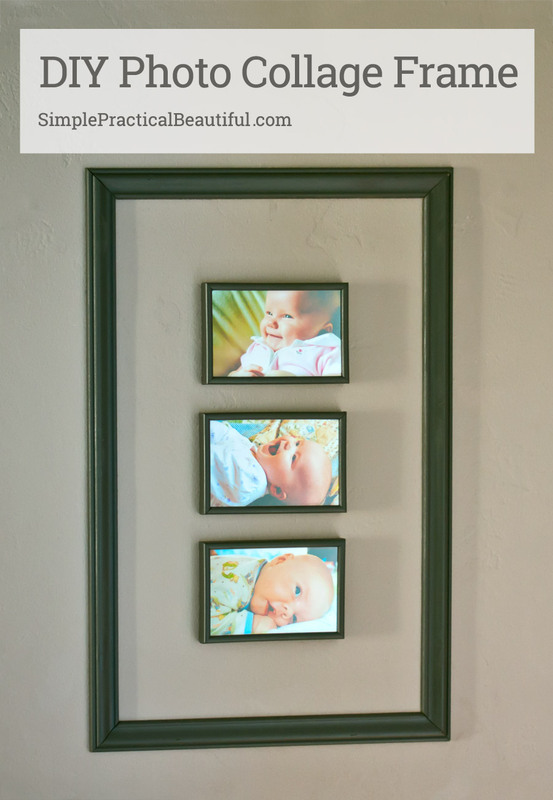 Display pictures of your babies in this easy DIY collage frame. 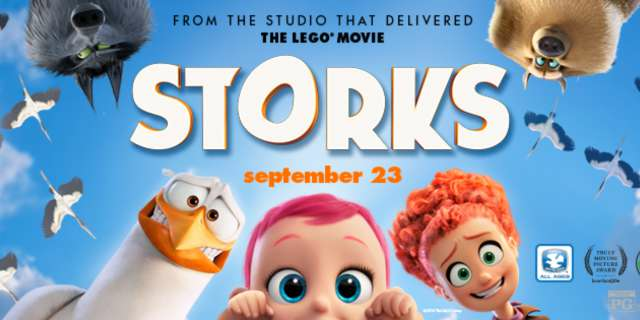 We saw the new animated movie Storks from Warner Brothers. It was a fun family movie with a couple of really hilarious scenes. I saw it with my oldest daughter, who loved it and couldn’t wait to tell her friends about it. Her favorite part was the wolf pack, especially when they turned into a minivan (you’ll just have to see the movie to understand that joke). I was trying to think of a fun DIY project to share that went with the movie. Since the wolf pack was our favorite part, a Halloween wolf costume would have been perfect. 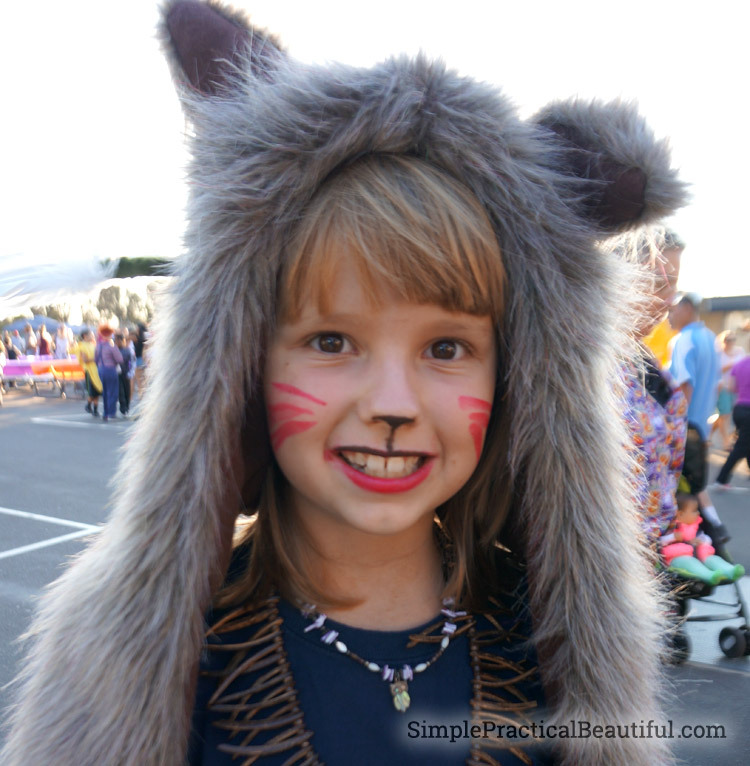 But I already shared how we made my daughter’s werewolf costume last year. But I also really liked how Storks repeatedly showed that babies are unbearably cute. Because they are. And my babies especially. 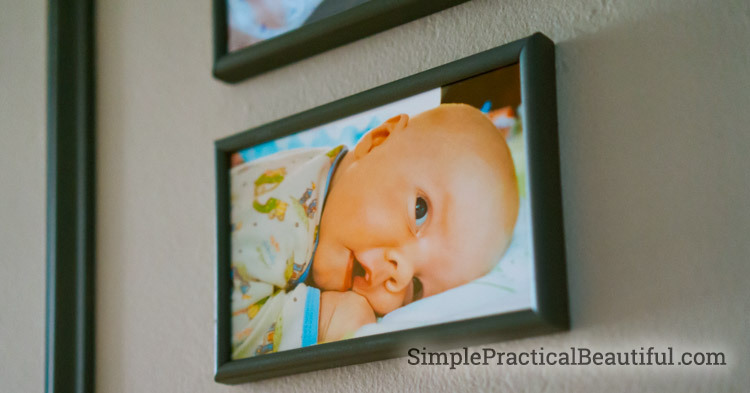 So I decided to do a DIY project with pictures of my babies– my kids when they were babies. 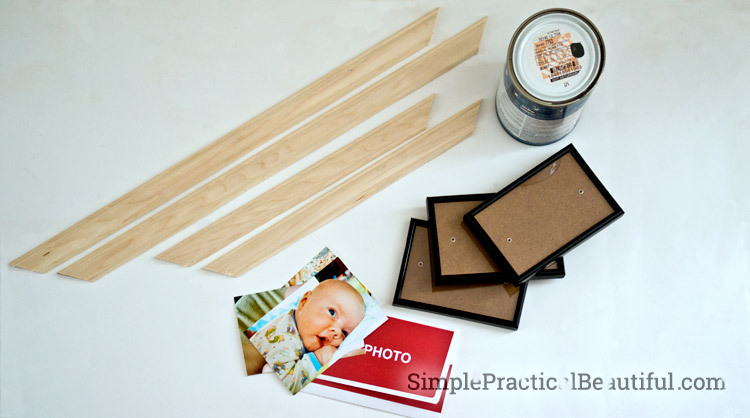 Today’s post shows how to make a simple DIY collage frame for 3 photos. You could easily make this for more or less pictures, depending on how many photos you want in your collage. I lined up the 4X6 frames so I could see what the final collage frame would look like. The small frames looked good at 3/4 of an inch apart and with a 3 and a half-inch space around them. That means that the inside of my large frame needed to be 22 inches by 13.5 inches. 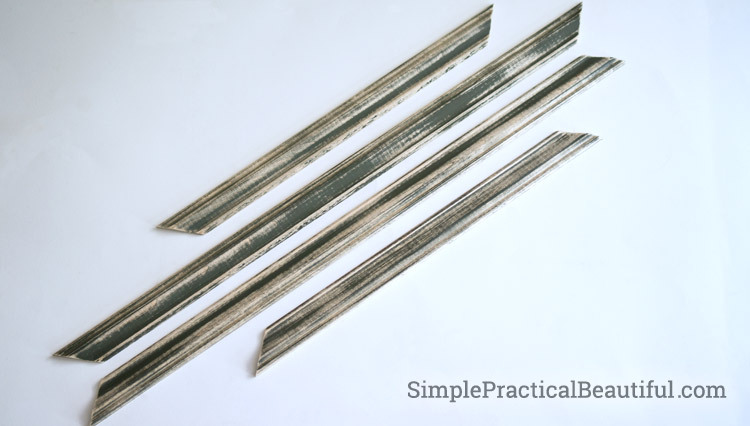 My post on DIY Poster Frame explains in detail how to cut molding to make a frame. You have to be sure the angles go the right way, so if you need some direction, please read that post. With the molding cut to the right size, I painted it. Okay, so I got a little over-eager and ahead of myself. I realized while the paint was going on, that I forgot to sand the wood first. Raw wood needs to be sanded before it’s painted because it has a rough and jagged texture. Here’s my molding after it was painted and then sanded. I took this picture because I love the effect. If I had a more rustic style, I would have just used it like this. Instead, I repainted the wood with a paint sprayer to get a smooth finish. A brush would have worked well too. I painted the small frames at the same time. I decided to use the gray paint we had used on my son’s Lego shelf. This frame will be right outside his room, so using the same paint will connect the spaces together. The gray also goes with my ocean painting at the end of the hall where the collage frame will be. I attached the molding pieces to the wall with a nail gun. 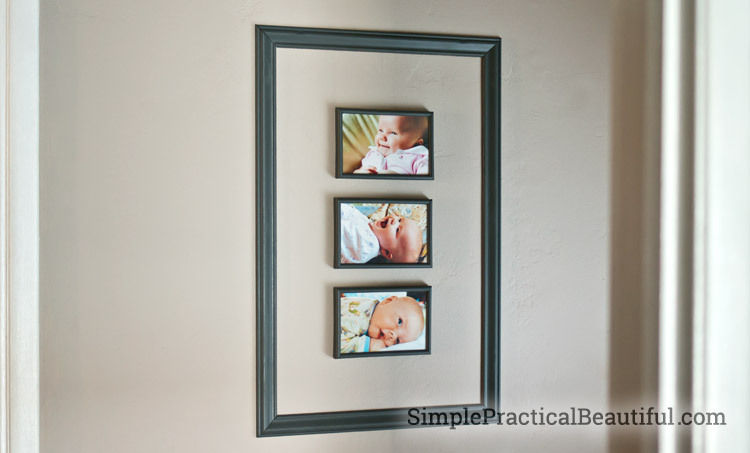 You could always go a less permanent route and connect the pieces to make a frame and hang it, like I did in my poster frame post. 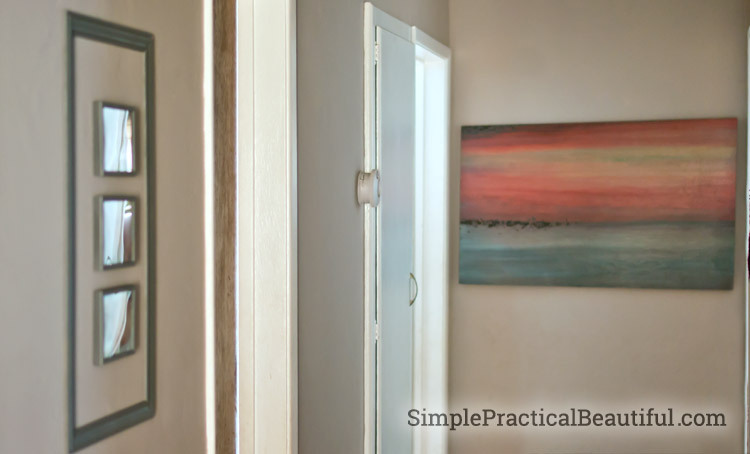 To get the frame on the wall correctly, I used pieces of masking tape on the back of each piece of molding so that I could stick them on the wall then move and straighten the pieces before permanently attaching them to the wall. I started with the top piece. I measured to make sure it was in the center of the wall, and I also used a level to make sure it was straight. Once the top piece was attached to the wall, I put up the other pieces of molding, adjusting them to fit together perfectly. Then I measured and marked where the small frames needed to go. The frames are 1/4 inch thick, so the nail needs to be 1/4 inch down from where I want the frame to be (which is 3 1/2 inches below the top of the large frame). I printed my photos out with a filter that made the colors more vibrant and clear. It’s a filter that comes with Apple Photos. I used that filter because our hallway can be dark, and the gray paint on the frame isn’t very colorful. I wanted the photos to be the most noticeable part of my collage frame. You can’t see the photos very well in this pictures, but this is our hallway with the ocean painting at the end. 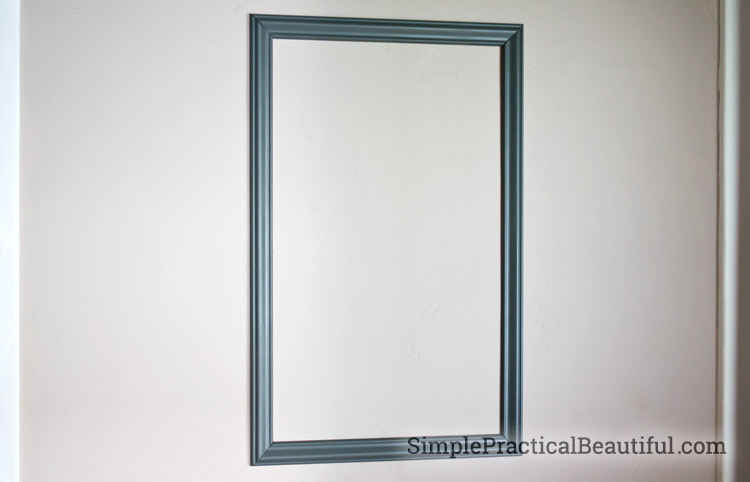 I love the blue-grays in the painting, which is why I chose to paint my new frames gray. And here’s my final pictures. 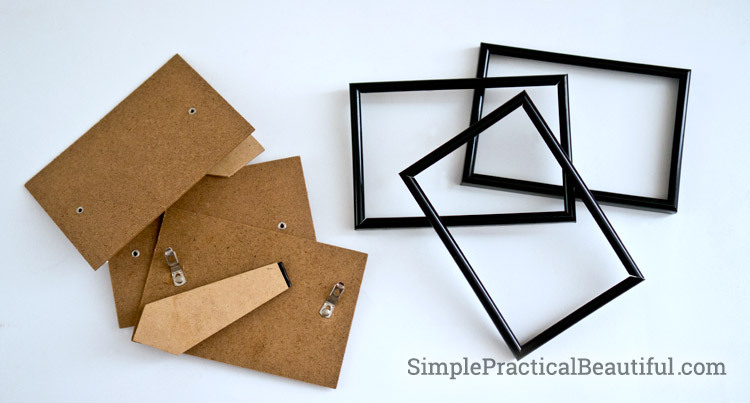 This frame in frame gives the look of a large collage frame at a much smaller price. I could paint the wall inside the large frame if I wanted it to look more like a mat, but I think I’ll leave it as it is. And now I get to enjoy the pictures of my cute babies every time I walk down our hall. Hopefully it will remind me how much I adore them, even when my kids aren’t acting so adorable.